The car symbol yesteryear of freedom, mobility and achievements staffs, is had become current affairs in the icon of an ecological revolution. The electric car is the new sustainable paradise and this new vision of the individual vehicle allows to certain architectures able to using these pseudo-advertising executives messages to generate new buildings that they add all these subject matters. The appearance of the private vehicle supposed as it could not be otherwise, a new reformulation of cities, of the understanding of the mobility and of own buildings. The car entered new problematic to solve in the buildings, such as radios of money order, parking lot circulations or spaces, as well as new programs such as petrol stations, buildings of parkings, concessionaires etc. The new society that it emerged with the freedom associated with the car demanded new architectures and without doubt the attraction for the machine and mechanisms ingenieriles that it suffered the modern movement are debtors of those illusions. Projects as the garage for 1000 vehicles in Paris designed by Konstantin Melnikov in 1925, or its evolutions as the built one in 1927 the Garages Bakhmetevsky in Moscow, in collaboration with Vladimir Shukhov. They are clear examples of buildings in which the use of industrial systems applied to the cutting-edge architecture and the fascination of the cutting edge for the to be able to unlimited of the industrial revolution gave as a consequence architectures only entendibles low those circumstances. Nowadays, the energy crisis, environmental and as not the economic one have reposicionado the low industrial power the premise, to these inexcusable heights, of the sustainability. The car of great engine capacity icon of the to be able to staff of that which it drives is transformed now in an electric accessory of futuristic design that it seems not only to solve our mobility problems but instead to improve the environment with its meer presence. The current architecture very tied to the culture of the image and of the communication also has could exploit the resources of this new mentality and cash in of this systematic change of mentality. From this optics it is possible to understand the building emergence as the museum of the transport of Switzerland, work of the architects Gigon y Guyer inaugurated recently in Lucerne. The fronts of the building, a great container that it shelters in his interior all kinds of trucks, vans and vehicles are obvious and iconographic round. 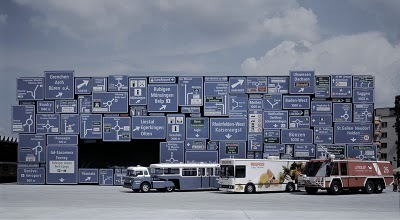 The most showy is the skin-patchwork of signs recycled of the Swiss highways. A reutilization that beside speaking itself of descontextualización and new messages to throw, he speaks to us about reutilization and paradoxically it indicates an endless number of directions to us. In the same line of this building, but if it fits with something more about rotundity one finds the Museum of the automotion of Madrid designed by the architects Tuñon y Mansilla, who is still in phase of construction. The building placed in a motorway junction appears as a great cylinder which surrounding one is constructed from the remains recycled of the own objects that will be exposed inside the building, this is, the auto body of cars that, after losing his use and being taken off of the engine and of the rest of the recoverable pieces of the complex mechanism that supposes a car, will be cleaned and squashed to happen to be an essential part of the closing of the building. 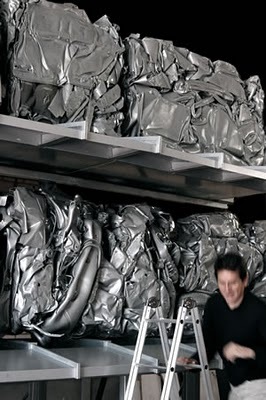 After a series of processes of galvanized, cleanliness and adjustment the utilization of pressed cars appears, not only to activate the memory of the visitor, but also as the representation of an active attitude opposite to the process of recycling and of ecological conscience. 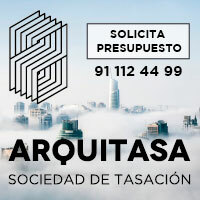 A more nearby example, but that reflects the same response of the contemporary architecture towards these questions so determinant, is that of Audenasa’s headquarters, the offices of Highways of Navarre, in Noáin, a municipality of Iruña’s periphery. Antonio Vaíllo and Juan Luis Irigaray have reinterpreted in this building the already mythical surrounding one of great black-backed gulls that were enclosing stones of basalt to leak the light and to support the idea of cave of the warehouses I dominate in the Californian valley of Bonus. Beside operating as a thermal bundle the exterior stony skin it was transporting the spectator towards the local materials, towards the rocks of the landscape and even towards languages near to the Land-art. Following the same beginning that the project of the Swiss duo, Audenasa’s north front, also operates as a thermal mattress, but in this occasion refilling the great black-backed gulls with the remains of the hundreds of tires that are gathered left in the of Navarre highways. These ashlars of recycled tires, as the previous examples, beside acting as elements of the surrounding one of the building, more or less lucky, speak to us also about a change of cycle in that the success is more in rethinking, re-using and doing of the waste virtue, that in continuing consuming without brake.